Difficulty Notes: Glacier travel over crevassed terrain, steep rock and snow with either a steep snow / ice finish or 5.2 exposed rock step. 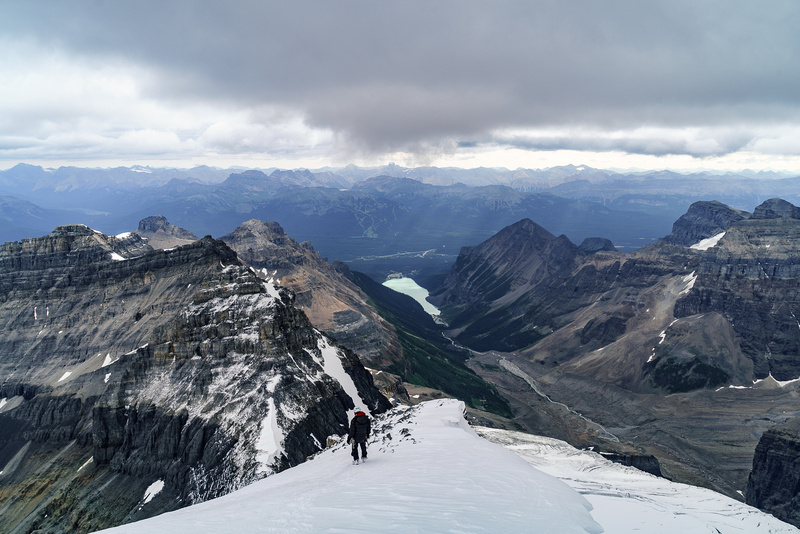 After climbing Mount Sir Douglas on the weekend, I wasn’t expecting anything spectacular for the following week. To be honest, as much fun as Sir Douglas was, I was feeling a bit burnt out and thought I needed a week off. Then the weather got nice. Then Ben and I started emailing. 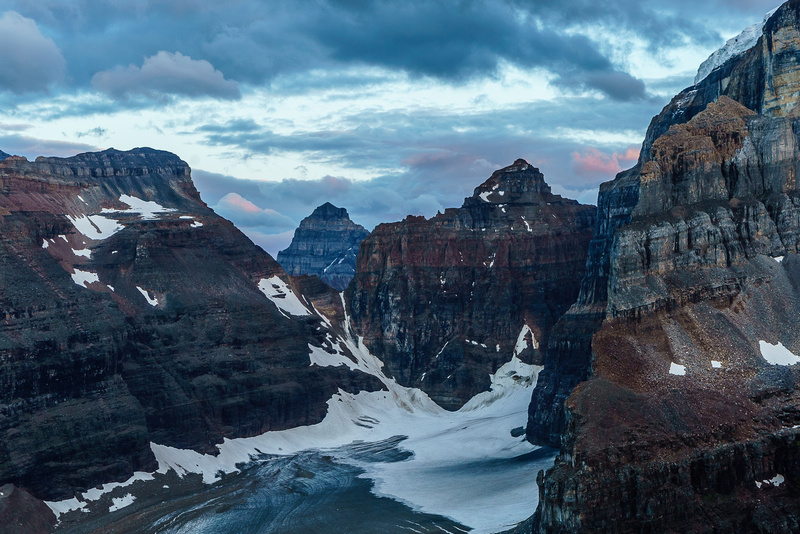 Then I found myself planning to leave Thursday evening for a shot at Mount Victoria – North Peak! Darn it. Nobody said being a peakbagger was going to be easy. 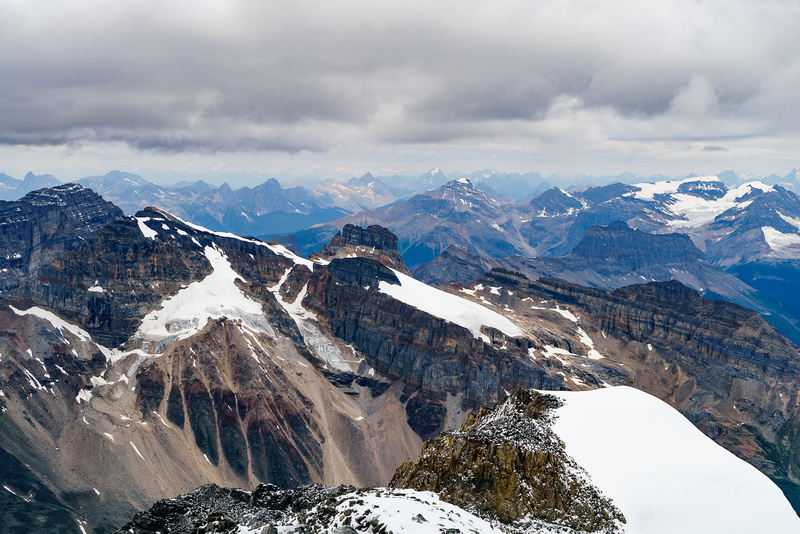 The north summit of Mount Victoria has been on my radar for many years already. It’s probably the one summit that I’ve made and changed plans on, more often than any other. Because it’s an easy approach, it’s usually the first 11,000er to get planned and then the first to get scrapped in favor of something bigger or more remote. Over the course of the 6 years or so that it’s been on my radar, most of my climbing friends have already managed to bag it on days that I couldn’t join them. Last year Ben and Steven attempted it. Both of them would have summitted if not for Ben’s crampon issues. 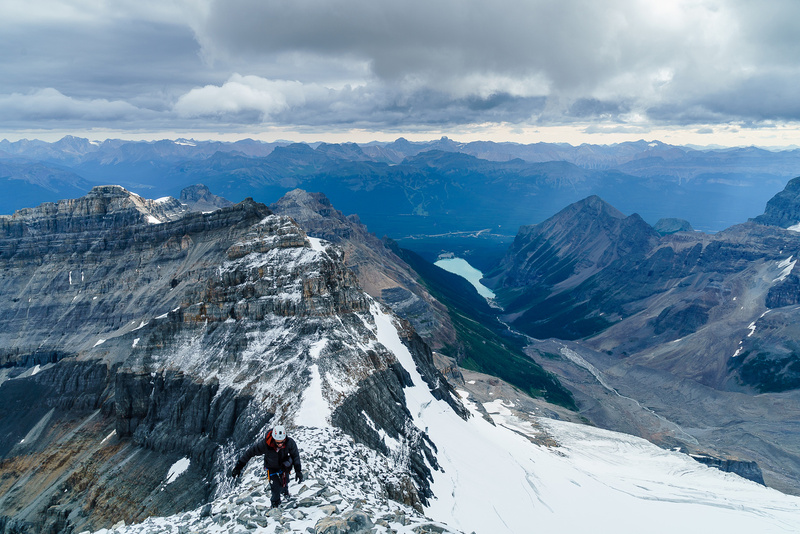 As it was, only Steven managed to summit and Ben wasn’t going to try again until he knew for almost 100% that it would go. 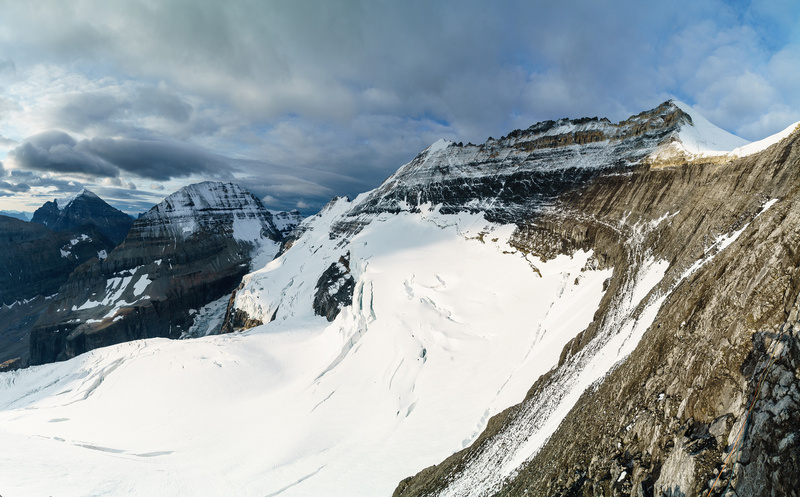 After several more false starts on it this year, Ben and I finally agreed to give it a shot on Friday, July 24th when a weather window looked to be opening in the Lake Louise area, just for us. 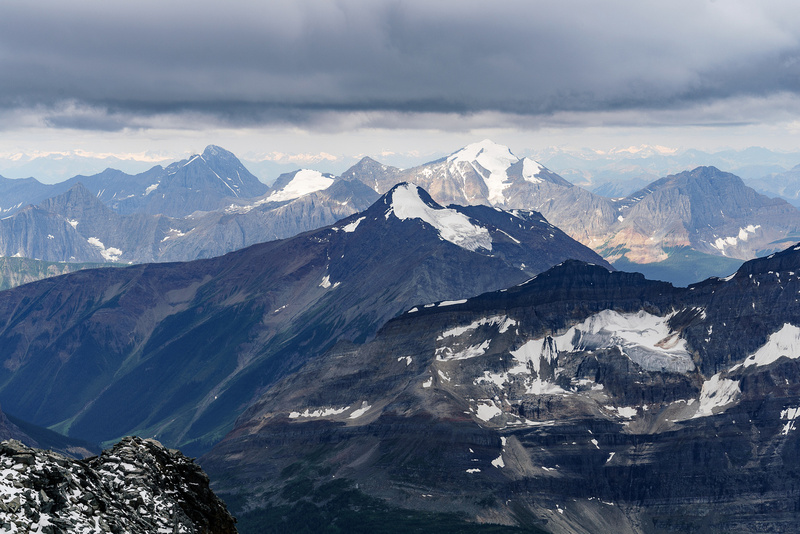 Mount Victoria is a long, very high ridge featuring two summits one km apart. 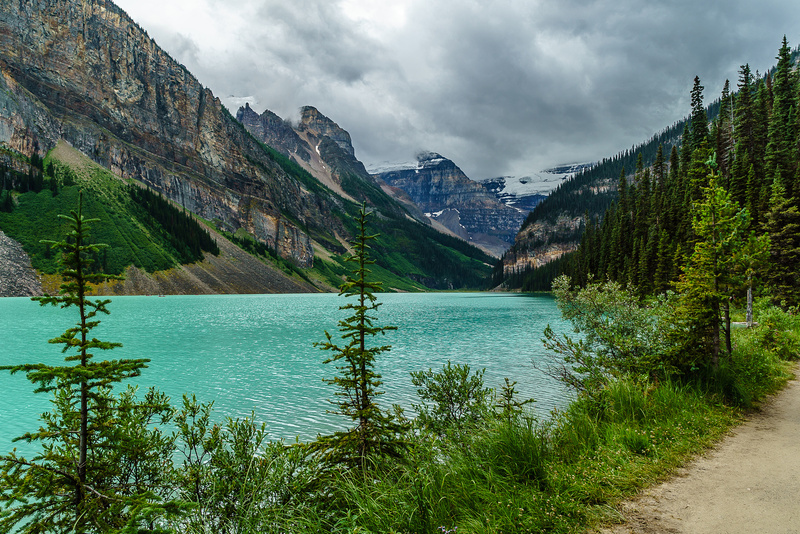 Together with Mount Lefroy, it forms the backdrop to the view across the lake from the Chateau Lake Louise. 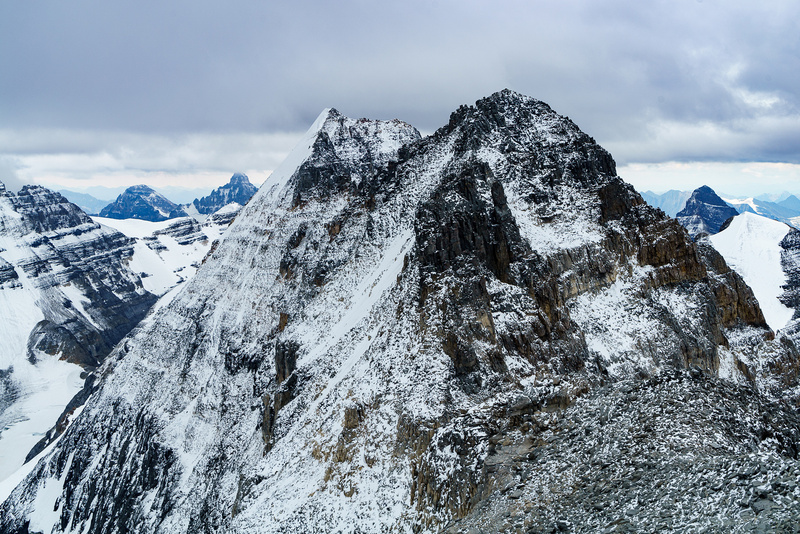 Although there is some confusion regarding the placing of the name Mount Victoria on this peak, it seems that it was named in 1897 to honor Queen Victoria who reigned over the British Commonwealth and Empire for sixty-four years until her death in 1901**. The mountain had previously been known as Mount Green after Rev. William Spotswood Green, a member of the British Alpine Club who visited the Rockies and the Selkirks in 1888. Lefroy is buried in clouds and North Victoria is out of sight to the right from the well used trail running alongside Lake Louise. Above treeline on the approach trail, looking back at Lake Louise and Fairview Mountain just right of center. We’re almost as high as Fairview already. There aren’t a ton of trip reports on North Victoria, but I’d heard from several sources over the years that it was anywhere from “easy rock and snow” to “moderate rock and ice”. Typical for Rockies large peaks, it’s all dependent on conditions and route choices. I think I was under estimating North Victoria a bit. 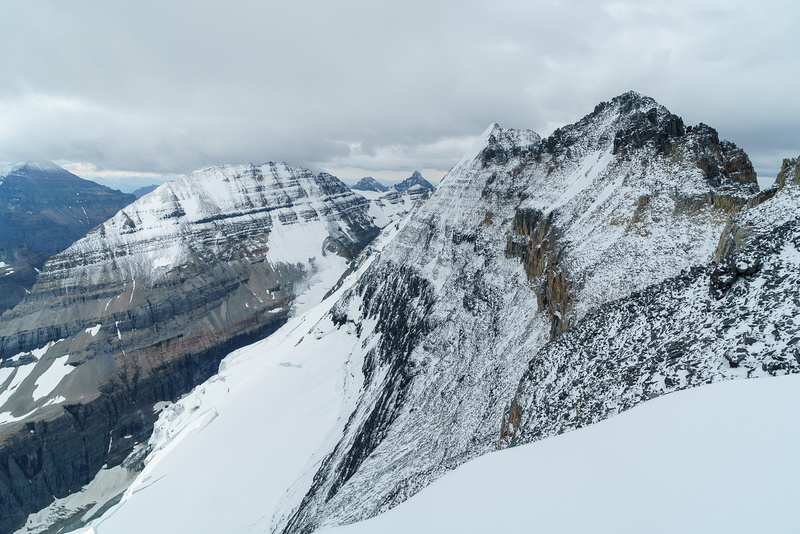 Parks Canada discourages bivying for this peak, which is strange because IMHO getting a good nights rest and starting 2 or 3 hours earlier on a big peak is always the way to go. I understand that there’s a good approach trail that can be done in 2 or 3 hours, but it’s hundreds of meters of height gain and does take something out of you before you start actually climbing. 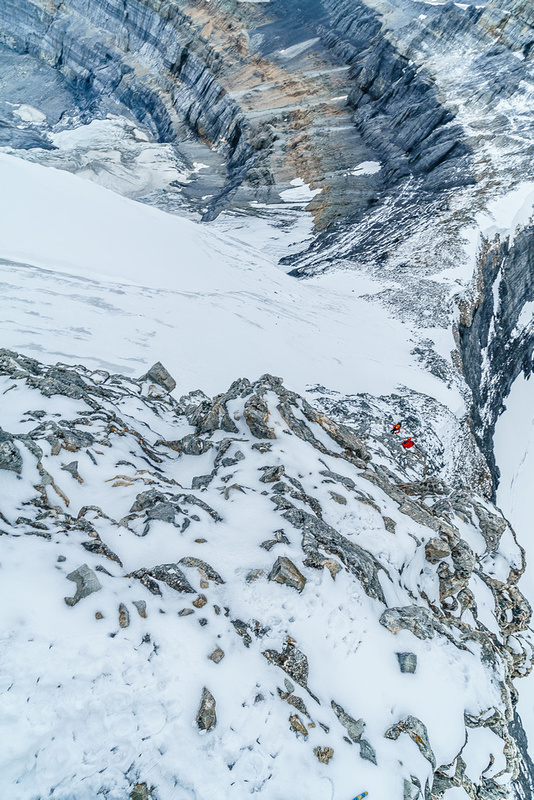 One hint to save weight on the approach – there’s a clean fresh water source near the bivy site just before the glacier so don’t carry too much water on the approach. Ben on the moraines below the glacier. The trail through here is fairly obvious and marked with many large cairns. Great views of the clearing sky over Aberdeen, Lefroy and Victoria (L to R) from near the bivy site. 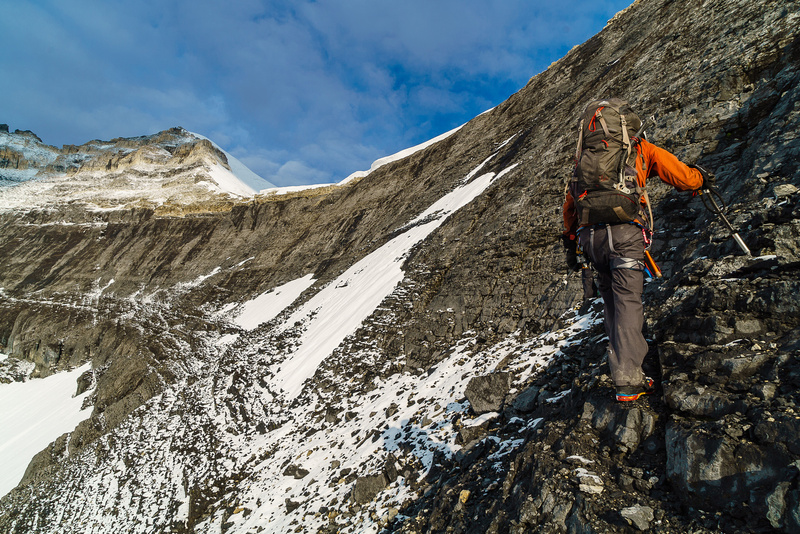 The approach for North Victoria Peak is very easy and quick, but I was feeling a bit bagged when we finally started up the glacier right above the high bivy coral. Rain on Thursday had saturated the few inches of fresh snow that came down in the same storm and our forecast clear sky was already clouding over by 05:30 in the morning! 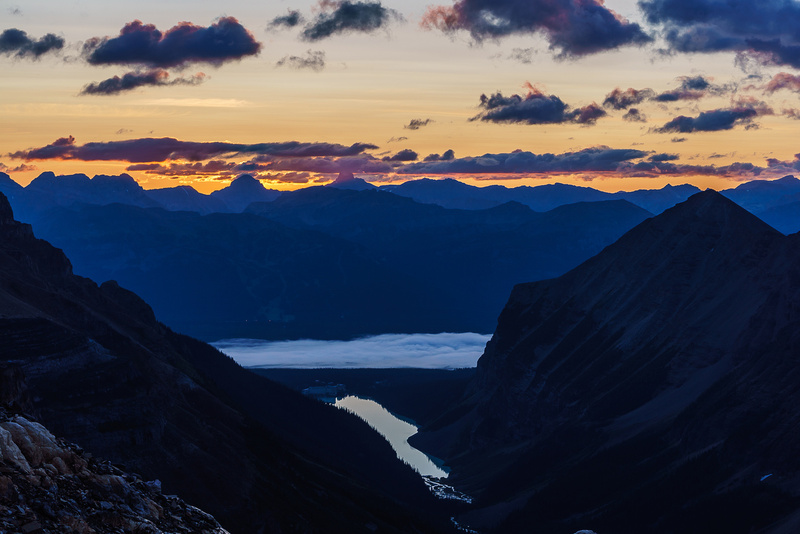 We witnessed a unique sunrise over Lake Louise, now looking like a tiny puddle underneath Mount Whyte and Fairview Mountain – which were also looking more like hills than mountains. 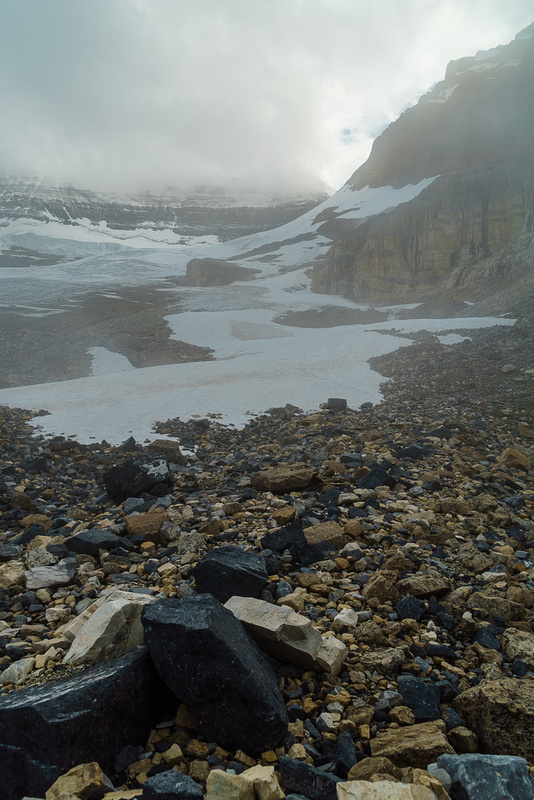 We watched lights flicker to the biffy from the Abbot Hut across the Victoria Glacier and above the Death Trap. 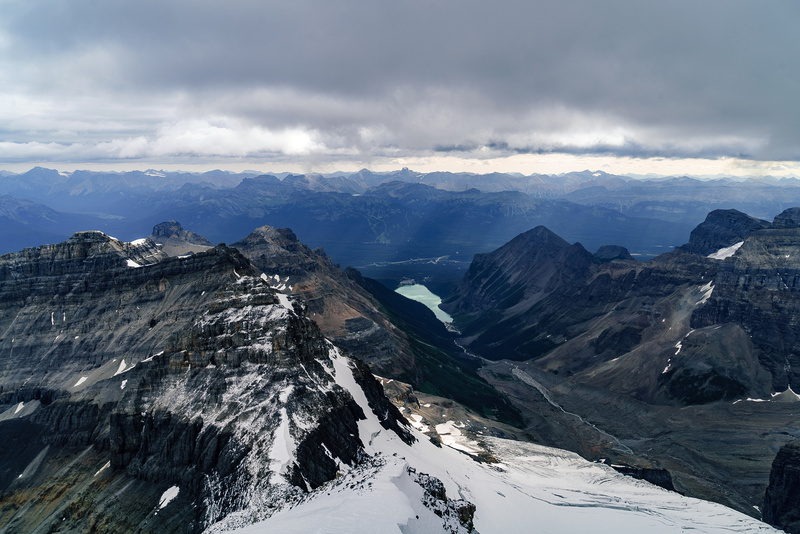 As the day slowly dawned, we could see fresh snow on our route and clouds covering our summit. It was very chilly and we were glad to have our Gore-Tex layers on. 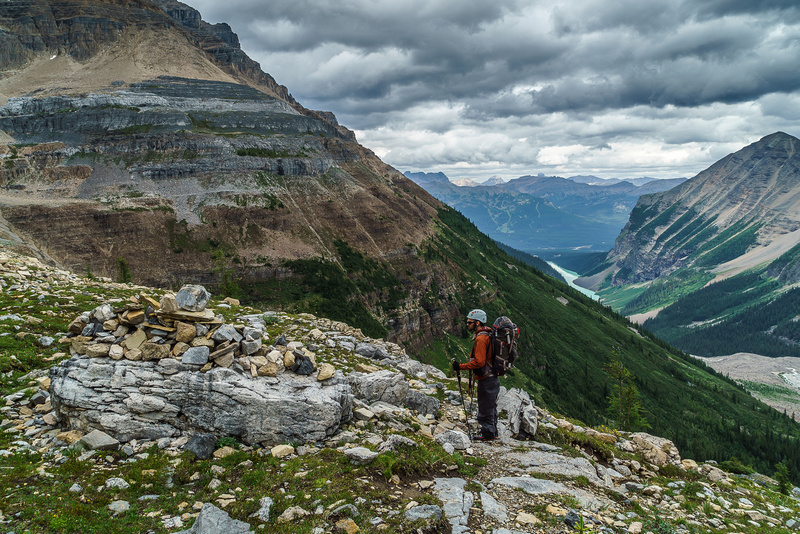 So far this day was turning out differently than expected – something that occurs quite often on the big peaks along the Divide. 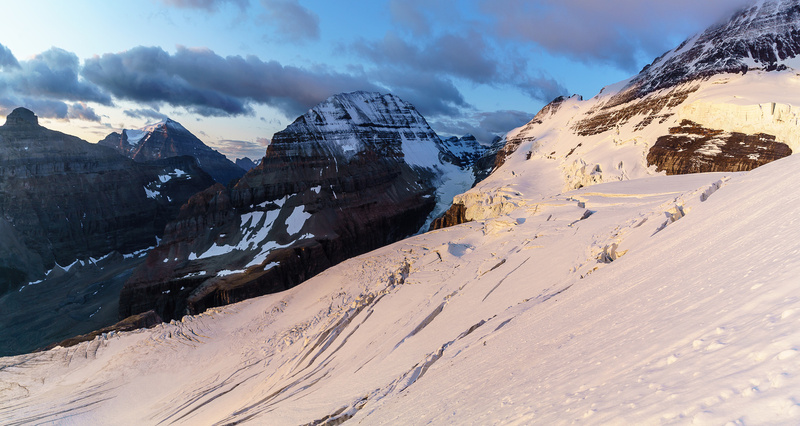 A fiery sunrise over Lefroy (L) and Victoria (R) as we approach the glacier. Our route was very different this year than last time Ben was attempting North Victoria. With plenty of snow coverage, Ben and Steven simply walked up the middle of the glacier on their snowshoes and Steven went straight up steep snow through the black band to the col. This year was obviously quite different. 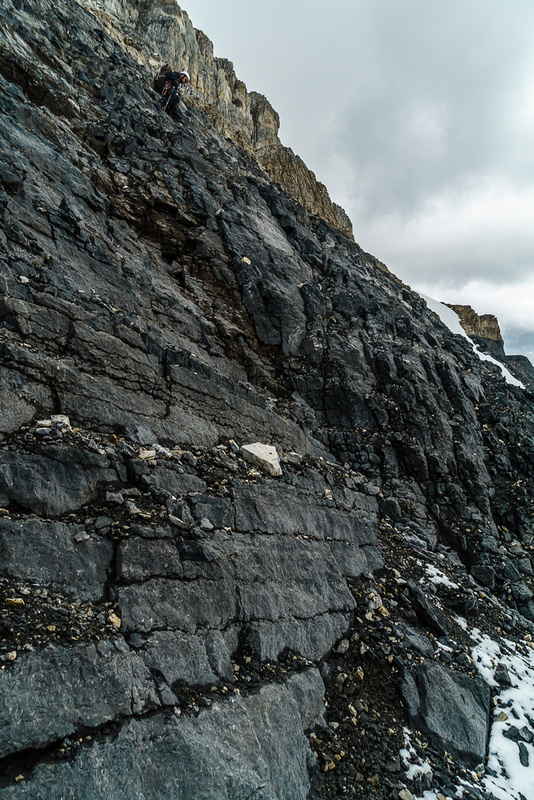 There were some scary looking holes on the glacier and with the warm temperatures, a dry year and now some rain making things even more of a mess, we wanted to avoid crossing as many crevasses on the glacier approach as possible. We started following some old tracks on climber’s right under steep rocky cliffs coming down from Collier Peak high above. When the tracks went towards the glacier on our left, we started traversing high on avy slopes to the right (north of the main glacier). Our route will not work if there’s any avy hazard so please don’t follow it blindly. The recent snow (how does that happen in a hot, dry year like we’ve been having?!) didn’t help matters any, because it was of slurpee quality. Our crampons insisted on sliding around on it rather than getting a good purchase and on descent this caused Ben no end of headache with his technical crampons which don’t have anti-balling plates on them. 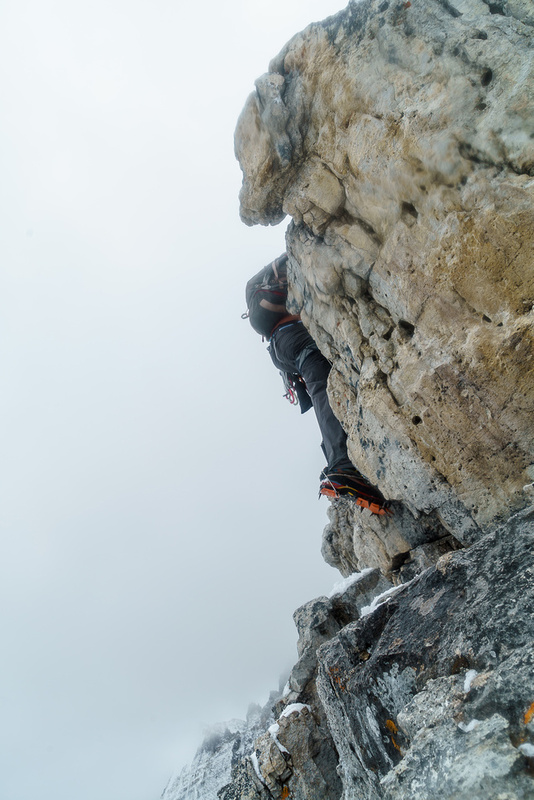 The slopes were pretty steep – easily steep enough to slide – and right underneath us were some giant holes so sliding or losing purchase on our footholds wasn’t an option. Our route for North Victoria. Note how far to climber’s right of the main glacier we were? This only worked in a dry year with no avy hazard on these steep slopes. Ben carefully probed the glacier / snow slopes as we climbed higher and higher to the black band, clearly visible ahead. We did find some holes and we avoided many others. 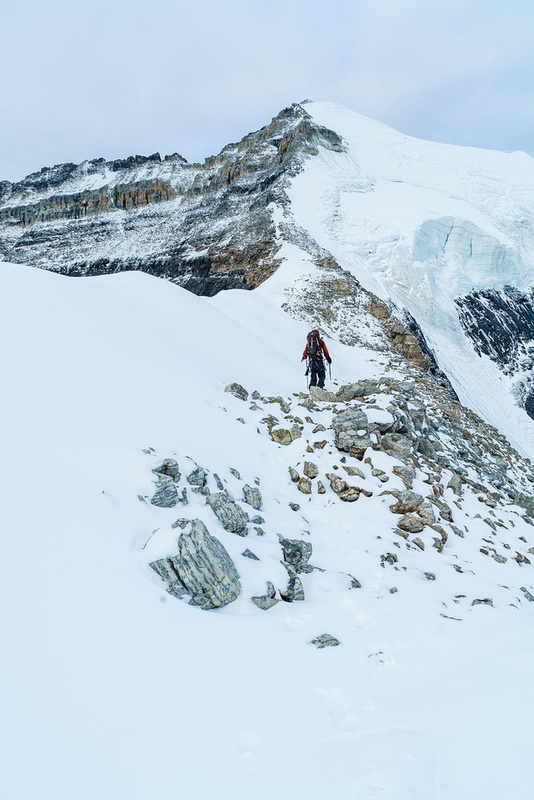 The worst part of our route was that we were paralleling many of the cracks – the most dangerous way to navigate glacial terrain because if the leader breaks through a snow bridge, there is a good chance the second is on the same bridge and both of you fall into the same hole! Again – please don’t just blindly follow our route if the main glacier is well-covered I would highly recommend that route. One advantage of our route was that it presented us with a beautiful and safe bergschrund crossing to the black band. I never felt unsafe with any of the bridges we crossed. After utilizing a short ‘via ferrata’ (some cord used to rappel the ‘schrund) we climbed a final steep snow gully that dumped us onto the lower section of the infamous black band leading up to the Collier / North Victoria col.
Mount Victoria North is directly above my shadow, while the main peak is at left of center. 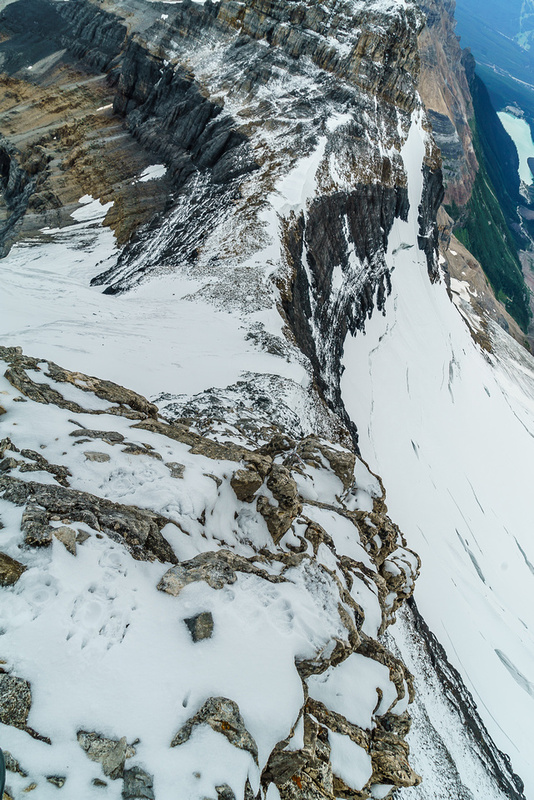 Note the huge holes under the snow slope – it’s much steeper than it appears on this panorama. The black band is obvious above Ben’s head. The black band is notorious for giving people headaches on North Victoria. People tend to underestimate it and end up with snow, ice, verglass, loose rock and more exposure than they bargained for. This is very evident from the copious amounts of tat we encountered while moving through the steep, stepped terrain. We were lucky. The dry conditions which gave us glacier issues below, were perfect for the black band section above. 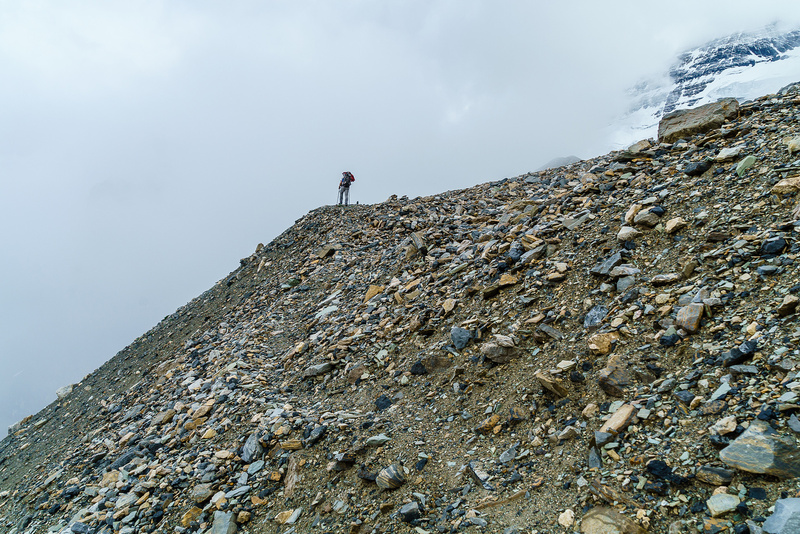 We found the terrain moderate scrambling at best, albeit with some pretty steep exposure near the top. The terrain was full of little ledges that were surprisingly solid, especially compared to Sir Douglas 5 days previous! I guess that’s not a fair comparison… As we topped out at the col, past the 6th or 7th rap stations, we both commented on how easy and fun the black band was. Looking ahead up the northeast ridge, conditions looked a little snowy but the weather was holding and we pressed onward and upward. Our views to the west and north were still quite good at this point. 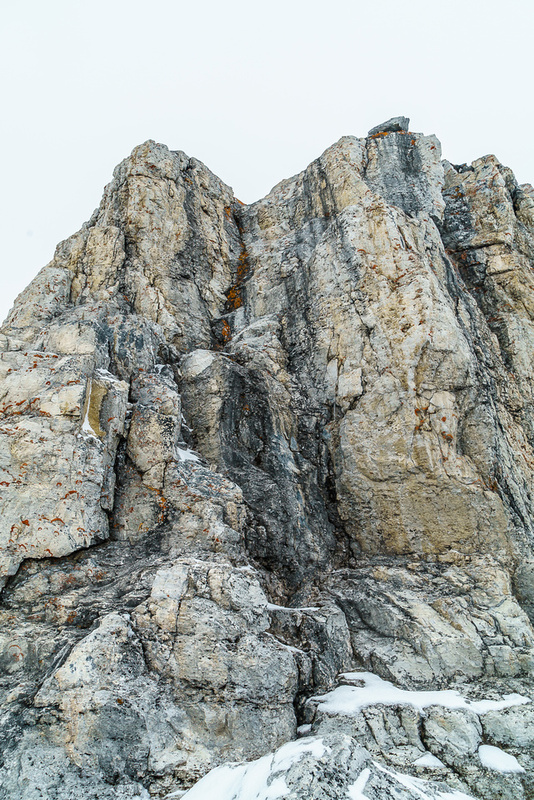 While only moderate scrambling, there is enough exposure that snow or ice can present unique challenges on the “no-slip” terrain. Nearing the col, you can see how steep the black band is. 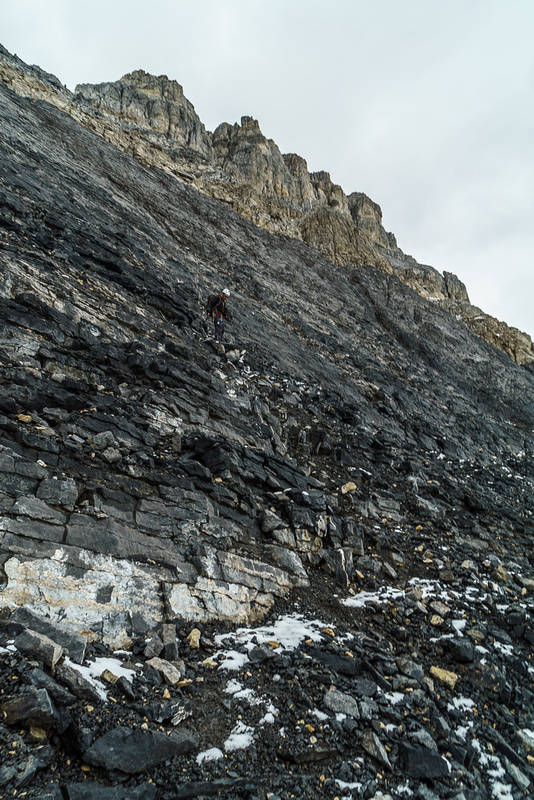 It’s not difficult with many little ledges and edges to climb or descend, but there is some pretty good exposure if you’re not used to this sort of thing. 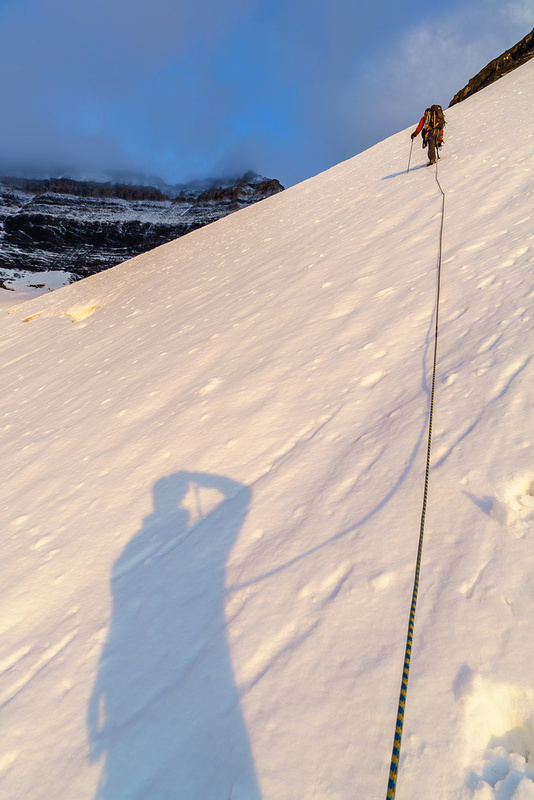 After a short traverse, we donned our crampons again and kept them on to the summit. The fresh few inches of snow made the rocks slick and a few sections of hard snow with some exposure encouraged us to simply keep the ‘pons on and bear with the scrapping and grinding on bare rock that always sets my teeth on edge – like a nail going across a chalk board. At first glance the northeast ridge above us looked pretty easy. We both commented that the crux “didn’t look that bad” and kept going. I remembered that Steven had also commented on the crux terrain as he bypassed it on snow, that it “didn’t look bad”. As we like to say in the mountains, “you never know ’til you get your nose in it”. This is also true of the northeast ridge of North Vic. 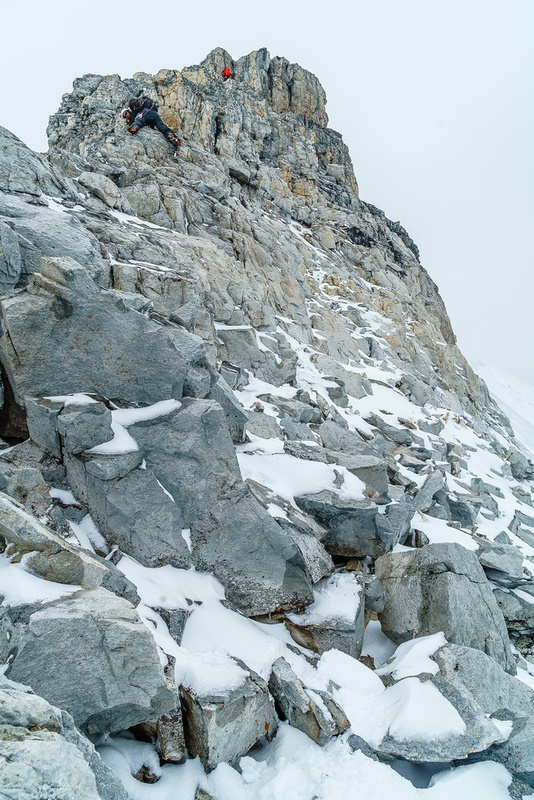 I certainly can’t say it’s the toughest terrain I’ve ever been on, but with the fresh snow, cool conditions and wind, combined with some very steep and exposed sections of rock just below the crux, it certainly wasn’t the easiest either. 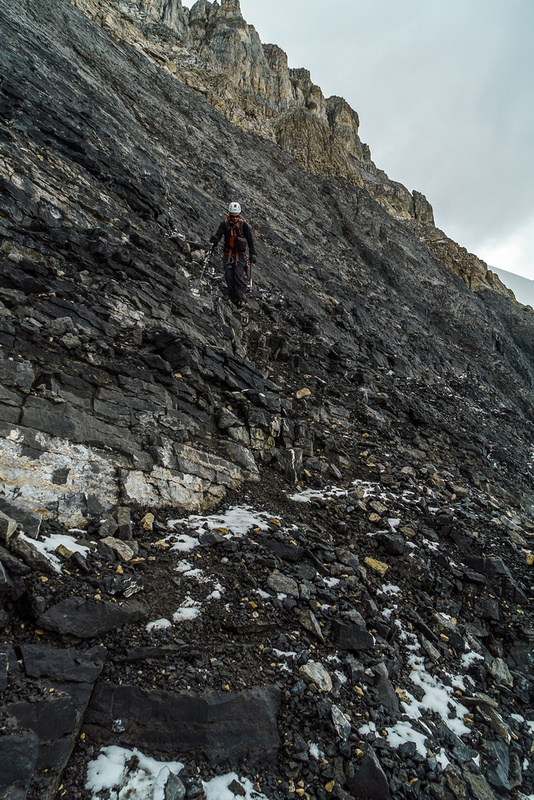 We passed two rap stations on our way up beneath the crux so this should give some indication of the seriousness of the terrain. It’s a winter wonderland! WTF – where did all this fresh white stuff come from?! The northeast ridge stretches above us with the crux rock step clearly visible and the by-pass looking very icy. The other option is to climb the 10-metre rock step, bypassing its prow via ledges on the left (5.3) and then moving back right. The implication in the above description, is that the ledge traverse itself is the 5.3 crux, not the move “back right”. I looked climber’s left from near our crux but the terrain wasn’t that inviting. I think without snow, it could be traversed and possibly a gully that was out of sight could be the “moving back right” section before re-gaining the ridge. We certainly didn’t traverse any 5.3 ledges and I’m 95% certain we didn’t bypass the “prow”, but went straight up it, only very slightly climber’s left of the front nose. Hmmm. UPDATE: After emailing with Bill Corbett (author of the 11,000ers book) he agrees with the obscure description is going to remove it from the new version. The crux is indeed, exactly where we ascended. Ben is halfway up the crux here – he’s decided to clip the pin and get a belay over the top. It looks much easier than it felt. After the crux it was a short ascent to the summit. The clouds weren’t lifting and we were rather chilly after dealing with the crux, so we didn’t linger long. 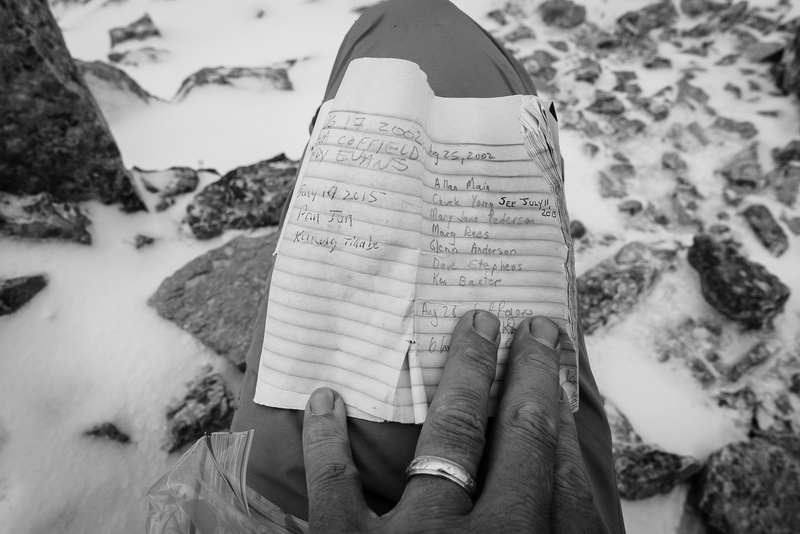 After snapping some photos and signing the 2002 register (4th ascent party of 2015), we started down. Looking along the summit ridge at left towards the true (south) summit with Walter Feuz Peak and Odaray across Linda Lake at center. Cathedral Mountain at right, Lefroy at distant left. 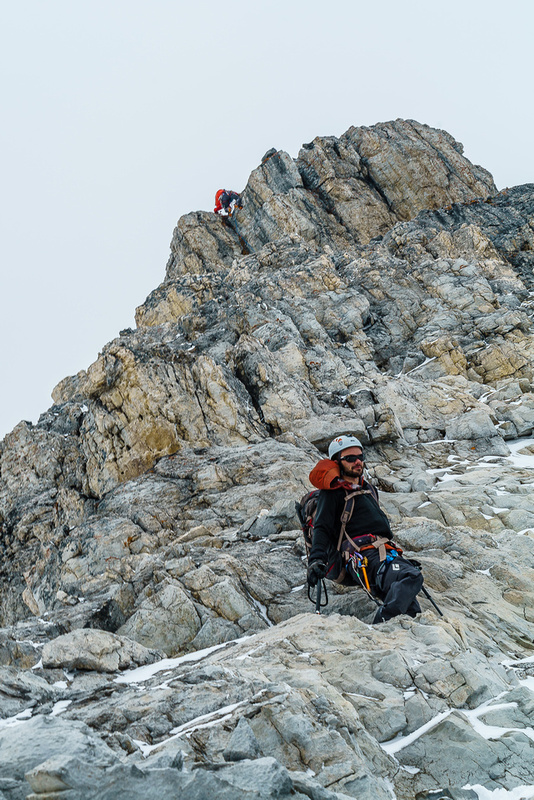 The traverse to Victoria South – the main summit – looks spicy! 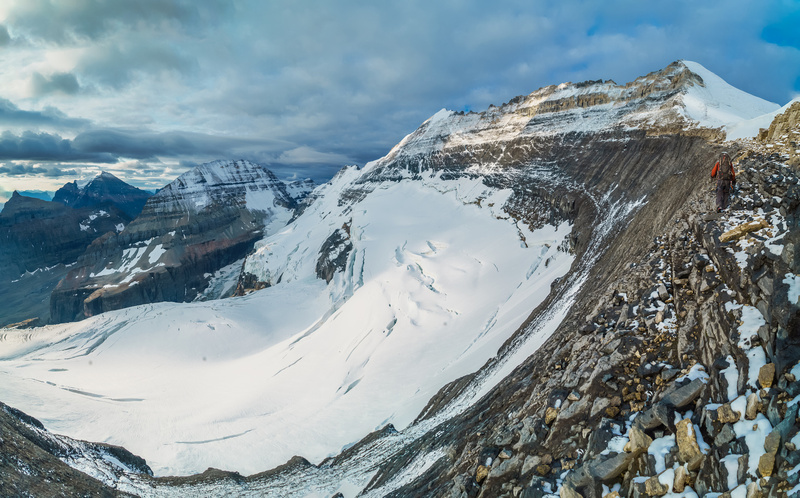 A great panorama of the Yoho area including (L to R), Mount Carnarvon, Field, Wapta, President, Vice President, McArthur, Isolated, Des Poilus, Yoho, Collie, Ogden, Baker, Niles, Balfour, Daly, Bosworth and many others. As we rapped the crux we saw two figures far below, just starting the northeast ridge. We waited for them part way down the ridge near one of the lower rap stations and after exchanging greetings we kept going down while they climbed above. He was studying to be an apprentice guide and she was his ‘practice client’. 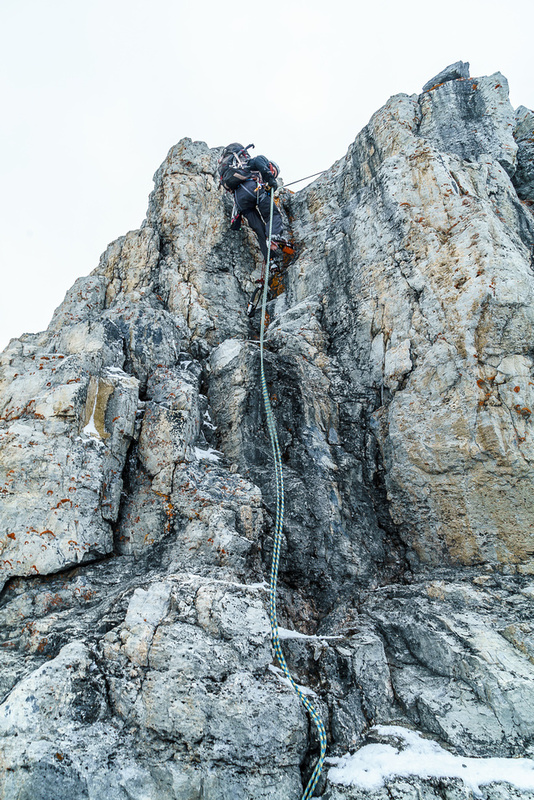 They were short-roped and moved efficiently towards the crux above us. 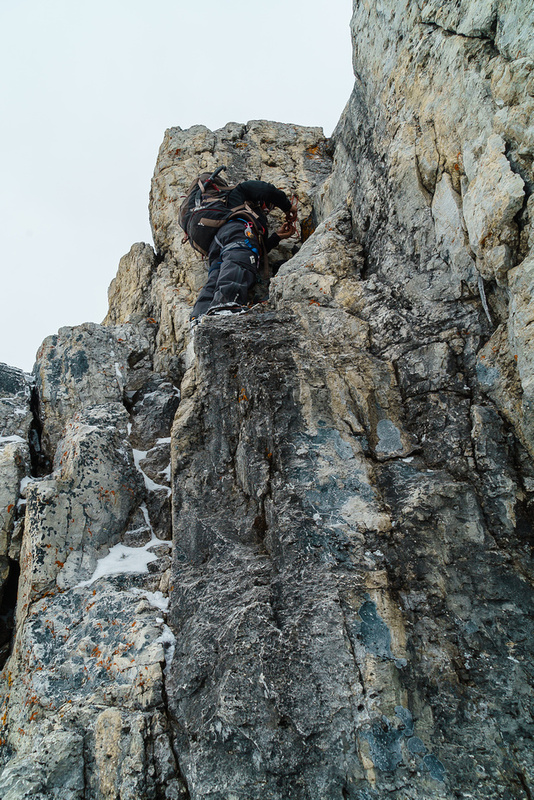 We downclimbed everything under the crux, but a few of the moves felt a wee bit desperate. I was glad for the crampons since they gave me purchase on some tiny little holds that otherwise would have been way too slick to use. Rapping the short crux. A 30m rope would have been plenty for us, but if you wish to rap the sections beneath the crux, a 60m might be good too. 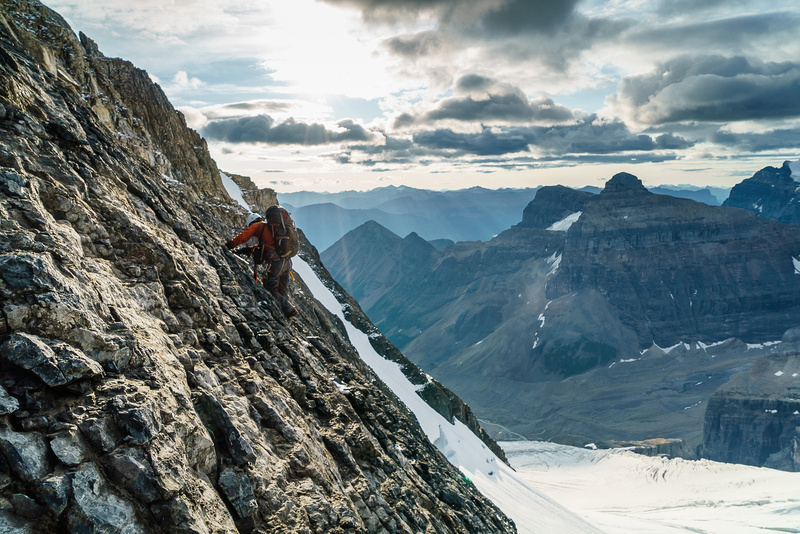 This view of Ben down climbing and the climber on the crux gives a better insight to the terrain on the northeast ridge – it isn’t horrible, but it is exposed in places. From the col, we easily down climbed the black band, taking care not to slip on the little ledges. 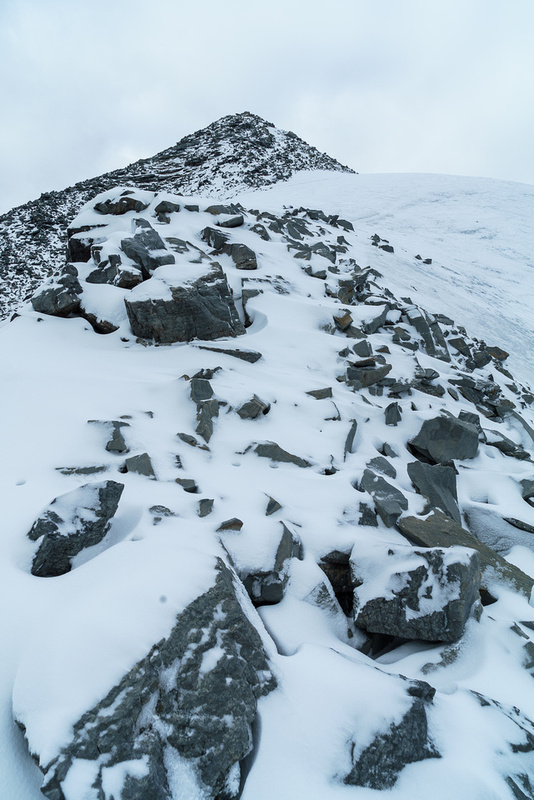 The snow gave Ben some crampon issues on descent to the bivy site – he has more technical than general mountaineering crampons and they don’t have very good (any?) anti-balling plates on them. 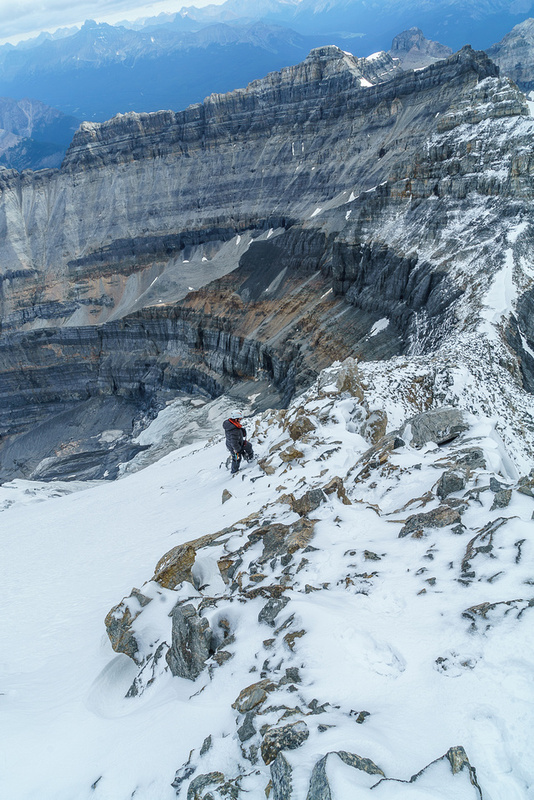 I felt sorry that he was so unstable on the steep, exposed snow, because I could ‘simply’ walk downward most of the time, without feeling insecure at all. 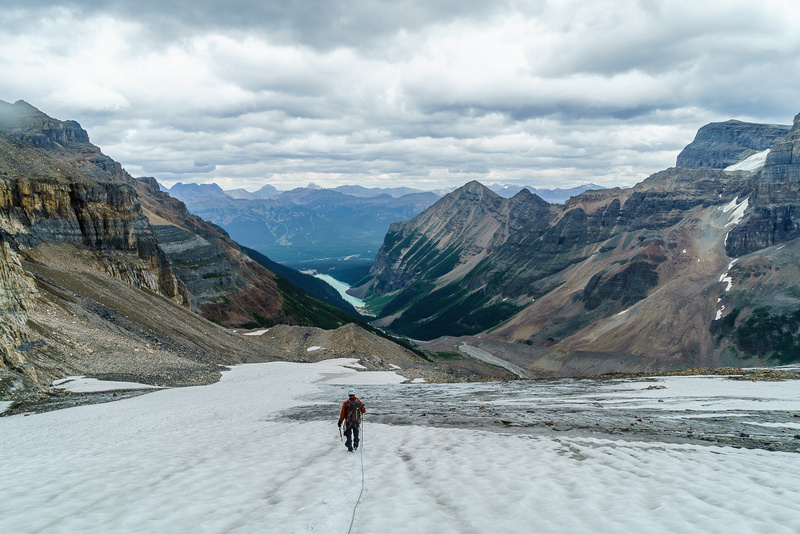 He told me later that with every step down, he felt like he could lose his grip and slide into the crevasses far below – not a pleasant way to walk down a mountain! Eventually we made it past snow line and onto old / hard snow and ice before the bivy and rock. 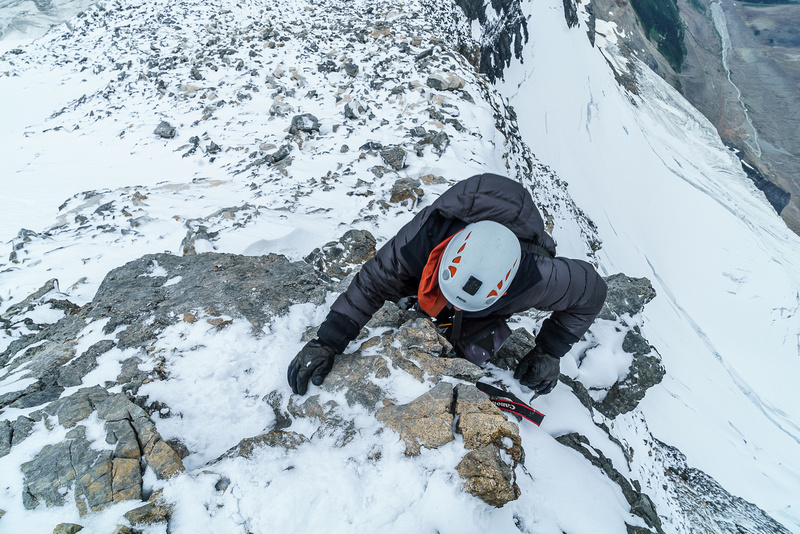 While not especially difficult, it is steep and loose in places – you certainly can’t afford a slip here and should be cognizant of climbers above. Crossing the schrund up high on climber’s right, above the main glacier which is below us here. Back in the land of the living as we descend towards Lake Louise. 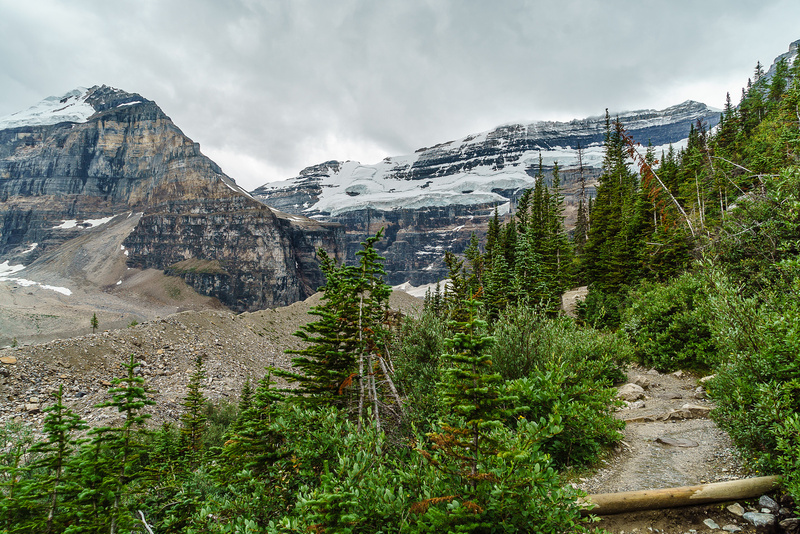 The hike out was fast and pleasant, with class II tourist-dodging as we approached Lake Louise itself. I really enjoyed North Victoria Peak. The terrain was varied, with snow, glacier travel, rock and great views all around. It was a wee bit spicier than I was expecting, which is also nice. Climbing gets boring if there’s never any surprises. Once again Ben and I proved a competent team and pulled off a safe and successful ascent. 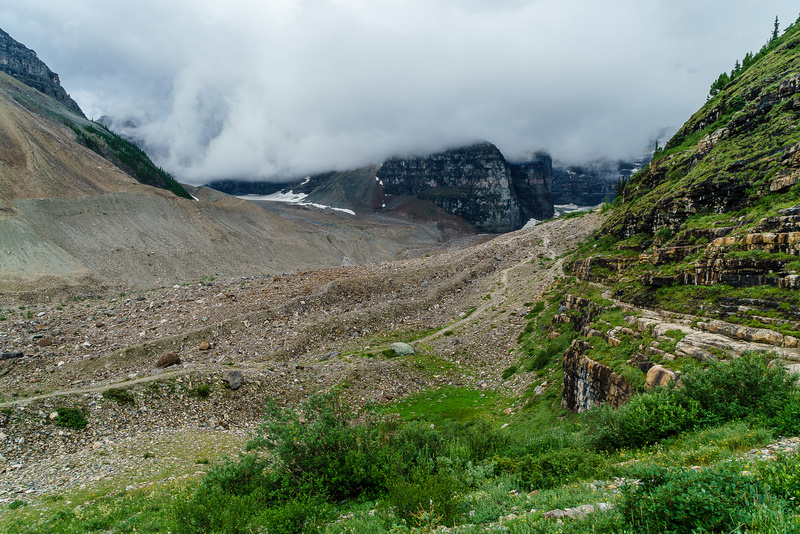 Low cloud hides the big peaks as we approach the cool ledge traverse on the main trail to the Plain of Six Glaciers tea house. On the excellent approach trail - too bad the vegetation was soaking wet from the storm that passed us by! 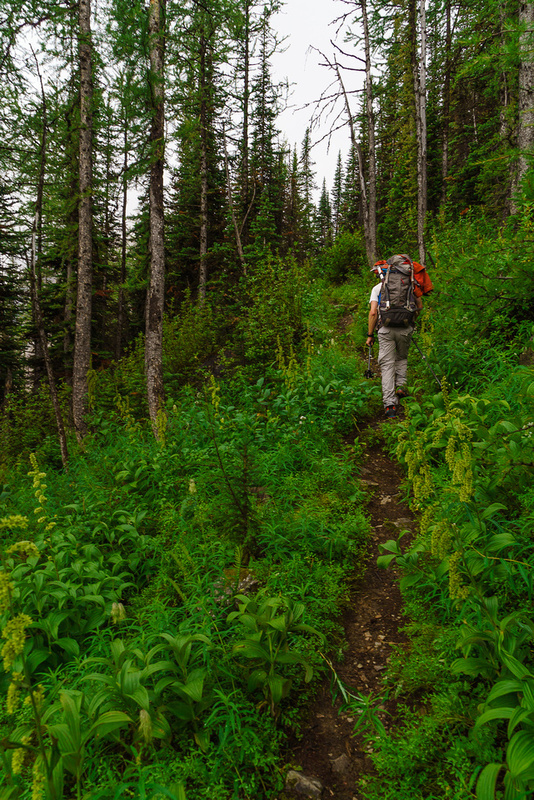 Hiking steeply uphill on a well defined trail. As we ascend into clouds, North Victoria shows her moody side. 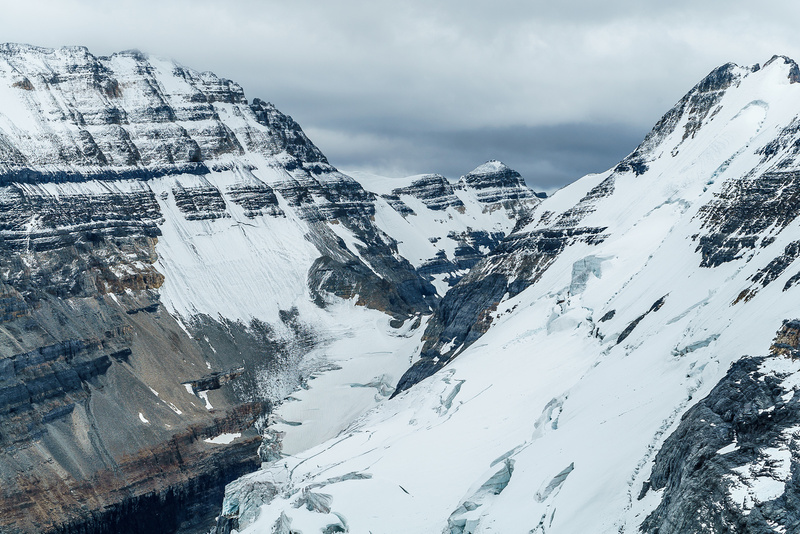 Mount Lefroy looks very impressive rising into the clouds, high above the Death Trap glacier below. Mount Whyte, Fairview, Haddo, Aberdeen, Lefroy, The Mitre and Mount Victoria South and North Peak from L to R.
A gorgeous sunset view over The Mitre with Pinnacle Mountain in the background. 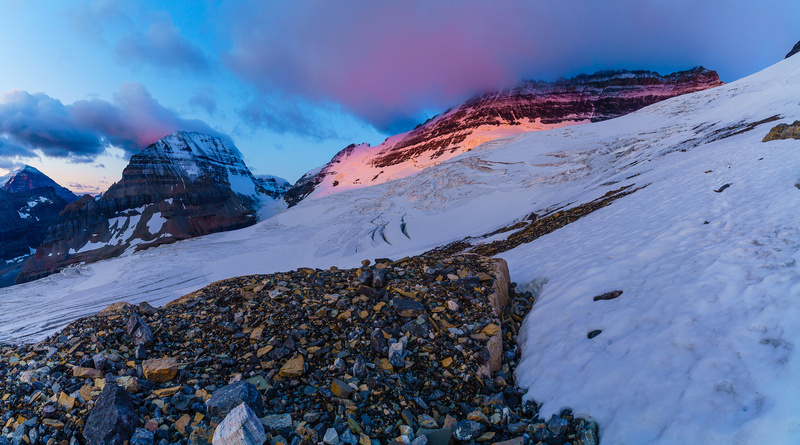 Sunrise over Lake Louise from the bivy site. Sunrise on Temple (L), Lefroy (C) and Victoria (R). Sunrise over Lake Louise - Fairview on the right. Steps from the glacier, our summit is just visible at upper right. 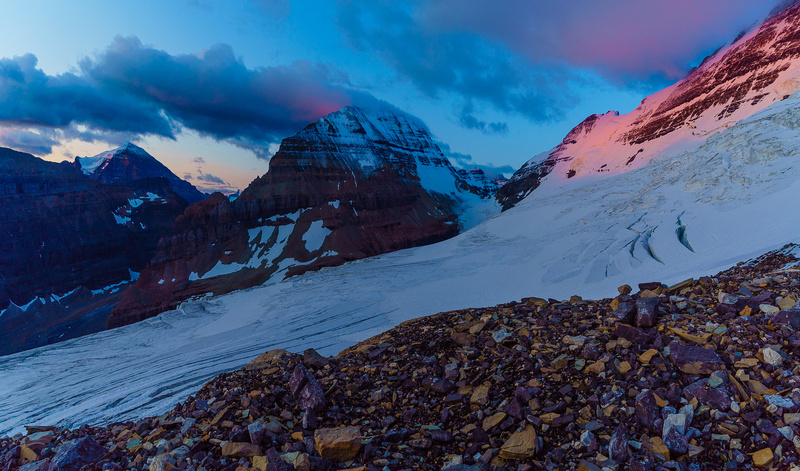 Now we're on the glacier as the sun peeks over the horizon and turns everything pink. 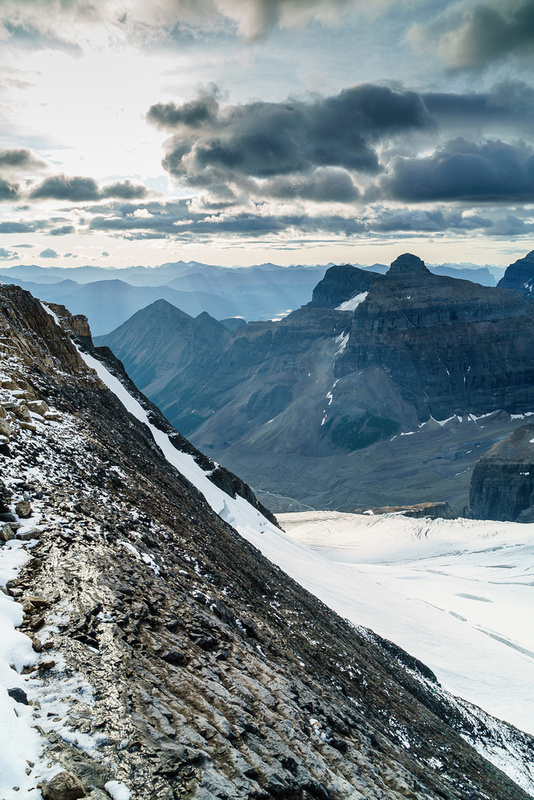 Looking out over the crevassed glacier towards Lefroy and Mount Temple. 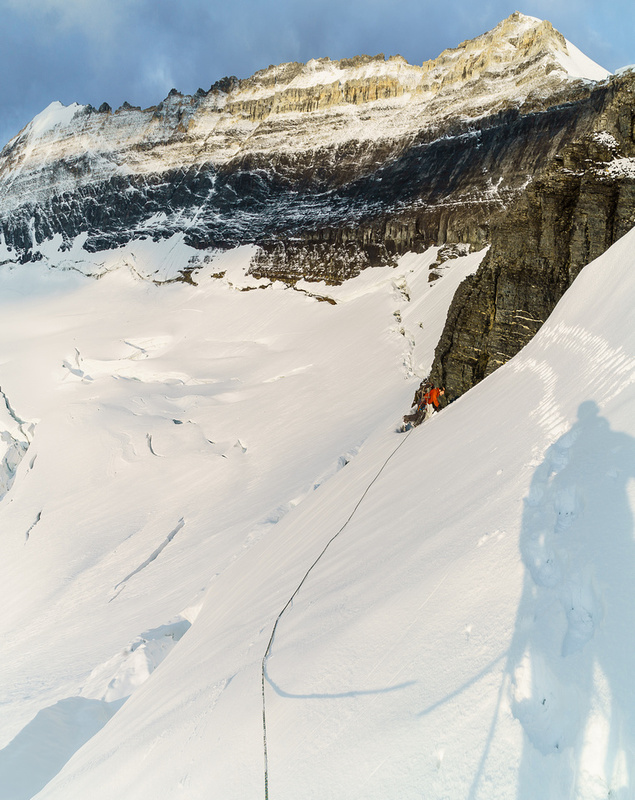 It's chilly, but the snow is already soft as we work our way high on climber's right above the main glacier. 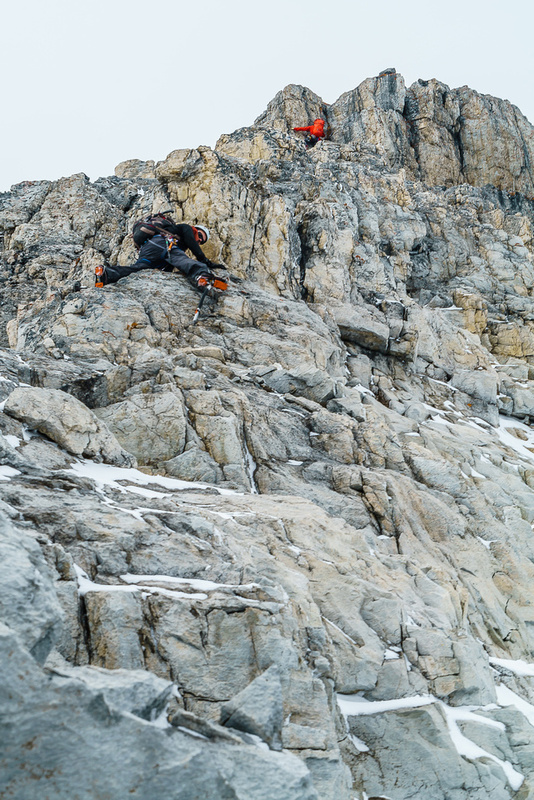 Ben carefully negotiates over the bergschrund, much higher on climber's right than most parties cross it. On rock, looking over the glacier towards Haddo, Aberdeen, Temple, Lefroy and Victoria (L to R). Ben starts up the black rock band. It started fairly easy, but steepened considerably near the col, high above us here. I love the way the black band wraps around the glacier and all the way along Victoria Peak. 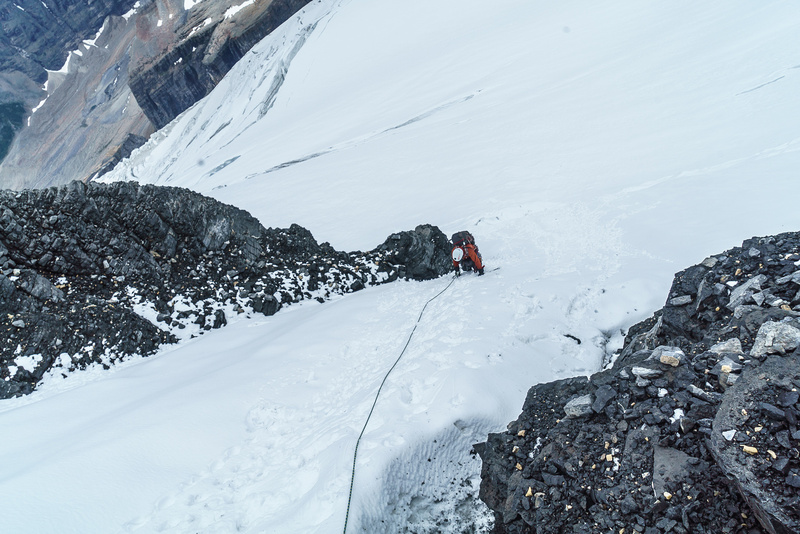 While only moderate scrambling, there is enough exposure that snow or ice can present unique challenges on the "no-slip" terrain. Nearing the col, you can see how steep the black band is. Reaching the top of the black band, looking back over our approach slopes at lower right and towards Haddo and Aberdeen in the distance. 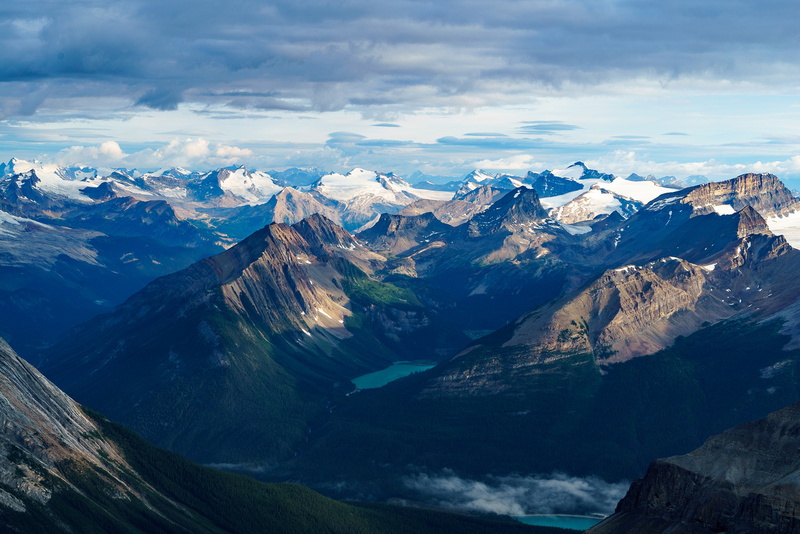 Summits include from L to R, Des Poilus, Yoho, Ogden, Collie, Niles, Balfour and Daly with many others less visible. Ben proceeds up the northeast ridge from the col with the rock step and summit visible above. 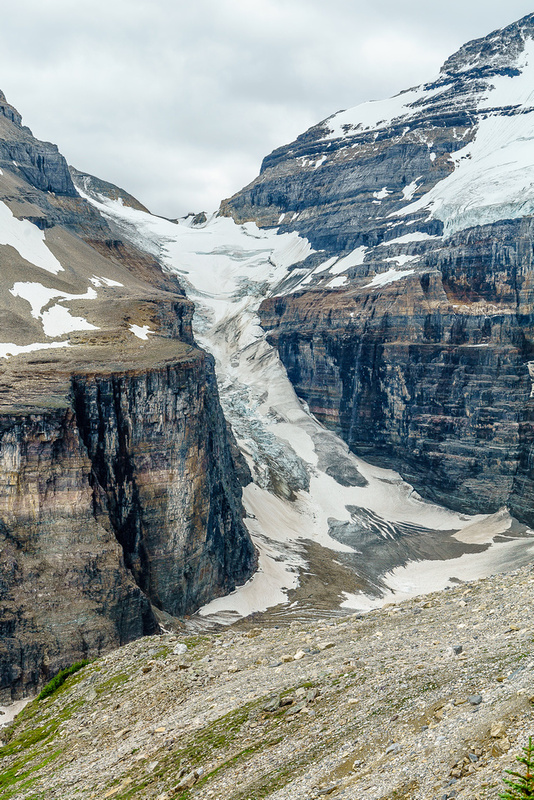 An interesting view way down the North Victor Glacier into Watchtower Creek. The northeast ridge stretches above us with the crux rock step clearly visible and the by-pass looking very icy. Looking back over the col at Collier Peak. Another view back - this time we're higher than Collier and closer to the crux. Looking up the innocent looking crux step. Looking down the steep terrain before the crux. Ben is halfway up the crux here - he's decided to clip the pin and get a belay over the top. It looks much easier than it felt. 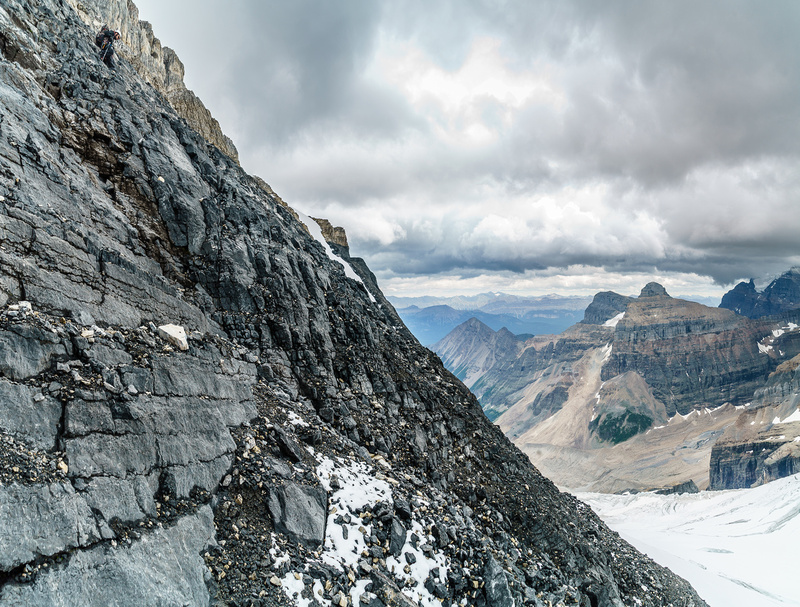 A pano looking back along the approach ridge from just under the crux. Above the crux, looking along the east face to the south (main) summit of Victoria. Ben comes up the easy ridge above the crux to the summit. It's still a ways to go after the crux - but easy. Where the heck did all this snow come from?! 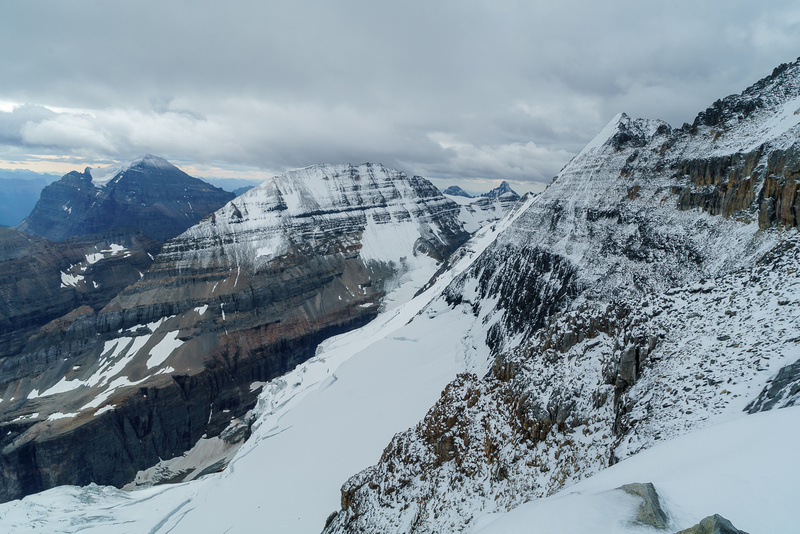 Looking towards Lefroy (L) and the true summit of Victoria at center. Views west (L), north (C) and east (R) off the summit. Popes and Collier peaks at center with Temple, Lefroy and Victoria at right. Walter Feuz Peak and Odaray across Linda Lake at center. Cathedral Mountain at right. A 2002 register - quite old for an accessible, Lake Louise 11,000er. Great atmosphere over Popes, Niblock, Collier, Whyte, Lake Louise, Piran and Haddo (L to R). Wouldn't want to be attempting Lefroy in these conditions. 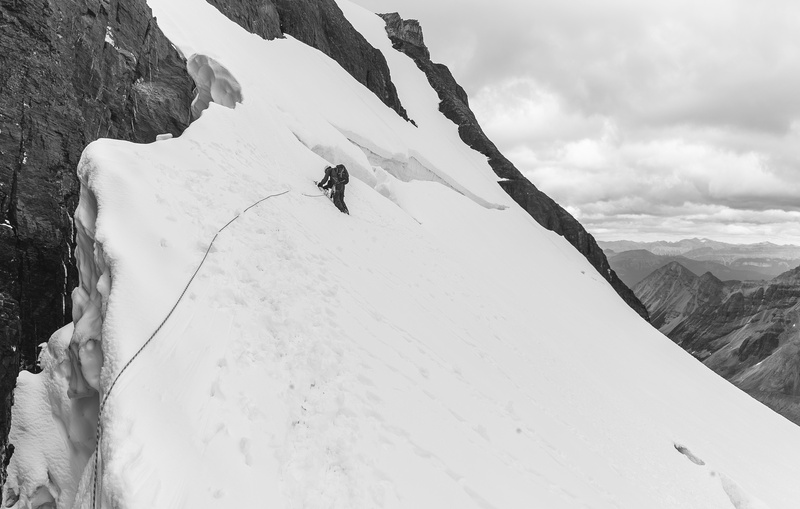 The traverse to Victoria South - the main summit - looks spicy! 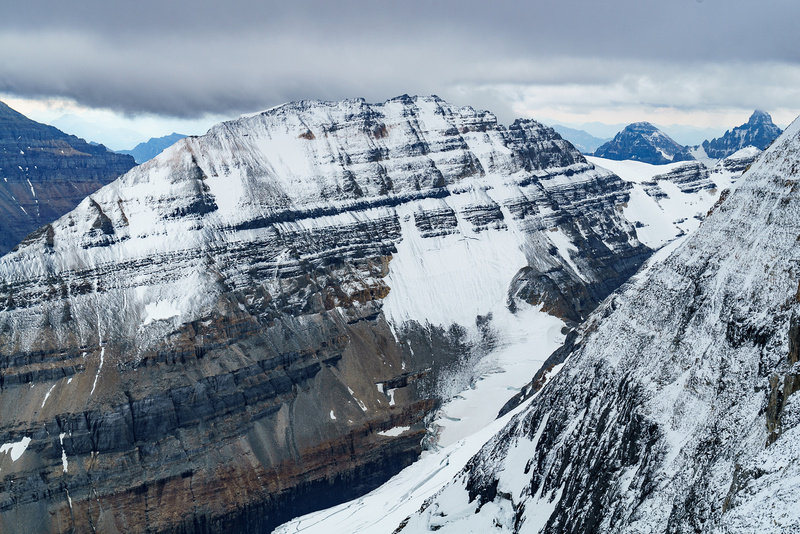 Mount Vaux rises over Mount Owen. Chancellor to its left and Hurd to its right. 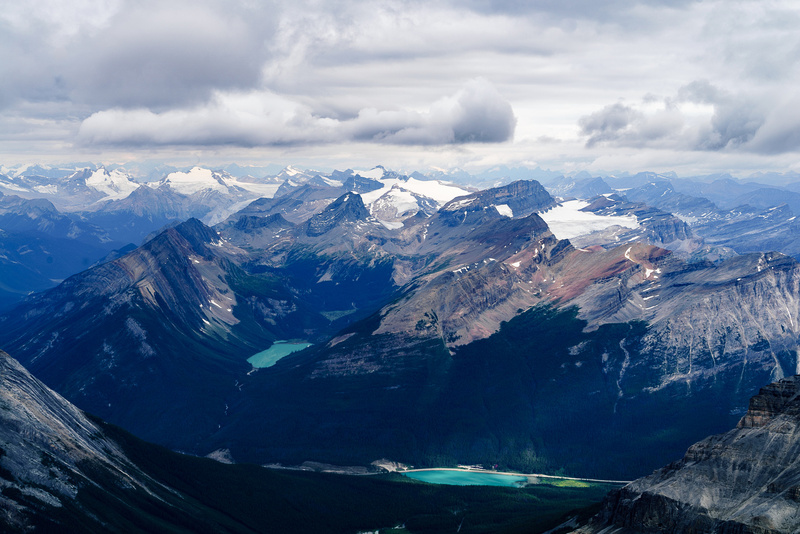 One more view over the teal colored Sherbrooke Lake (L) and Wapta Lake (R) towards the Wapta Icefield. Even Daly looks small now! Cathedral Mountain is an all-time favorite peak of mine. Carnarvon was my last Kane peak and the Presidents trip is another fine memory. Ben descends the summit with Fairview, Haddo and Aberdeen looking a lot lower than us and Mount Temple buried in thick cloud on the far right. Downclimbing a short cliff band above the crux. Two bright dots come up towards us. This terrain could easily justify another rappel and judging by the tat, more parties choose to go that route than solo downclimb it. Ben is past the last crux on the ridge, and the other party is just clearing the last moves on the crux. 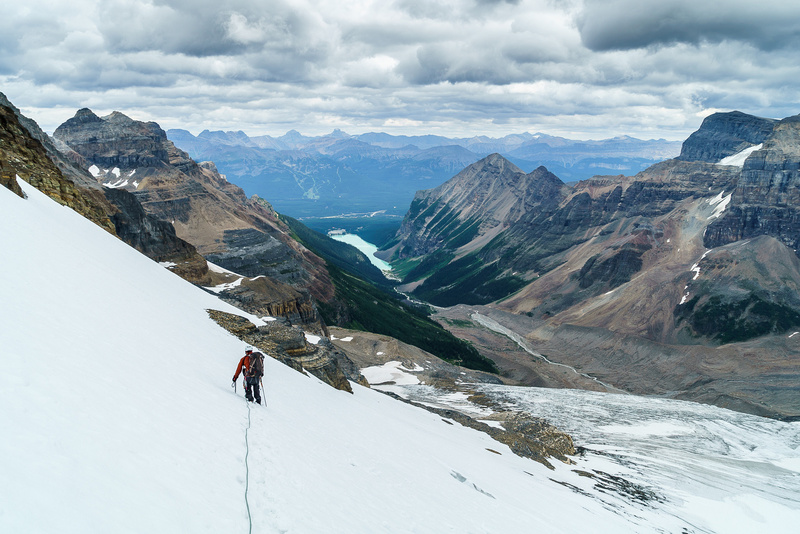 Ben descends to the col in this view looking down the North Victoria Glacier to the west. 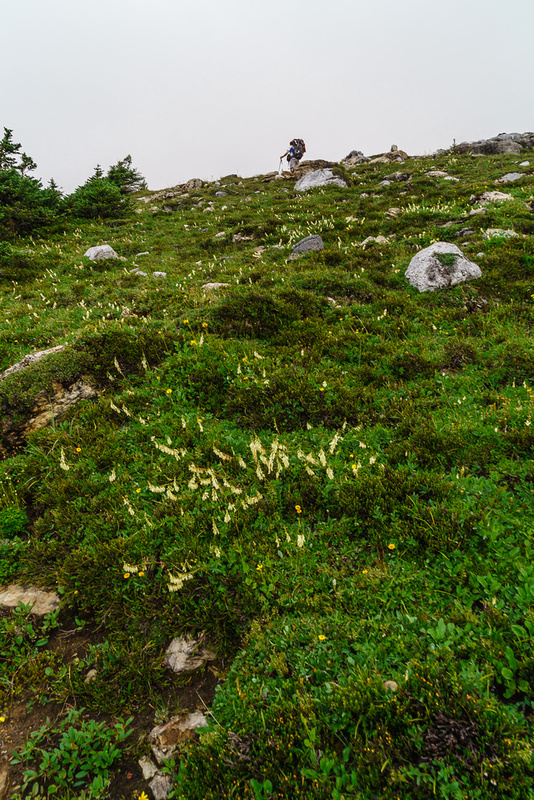 While not especially difficult, it is steep and loose in places - you certainly can't afford a slip here and should be cognizant of climbers above. 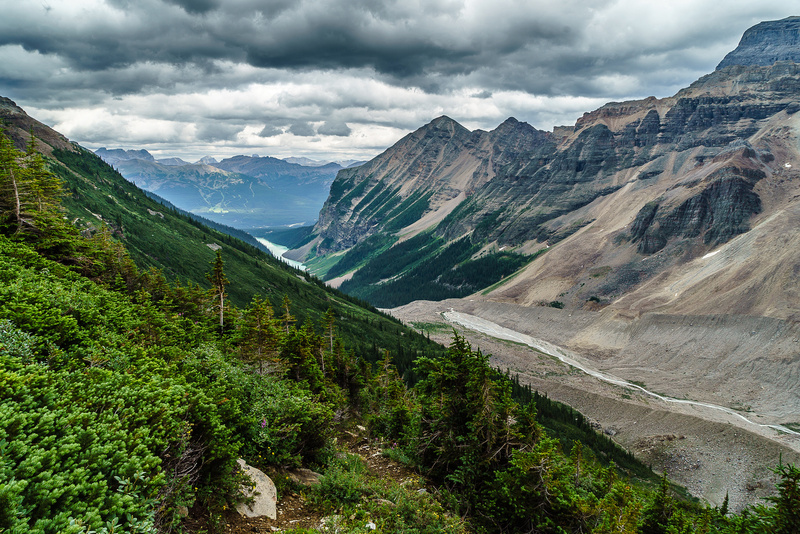 Looking through the Abbot Pass towards Mount Hungabee's summit. Down climbing the steep snow gully to the ,schrund. Crossing the schrund up high on climber's right, above the main glacier which is below us here. Haddo and Aberdeen start to look like mountains again as we descend towards the Plain of Six Glaciers. Ben stops to admire some serious stoneworks along the exit route. 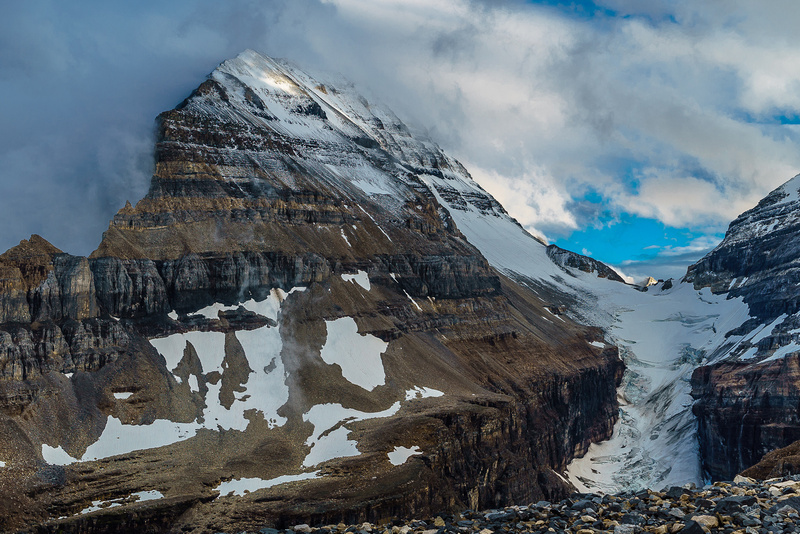 The Death Trap glacier up to the Abbot Pass / Hut. 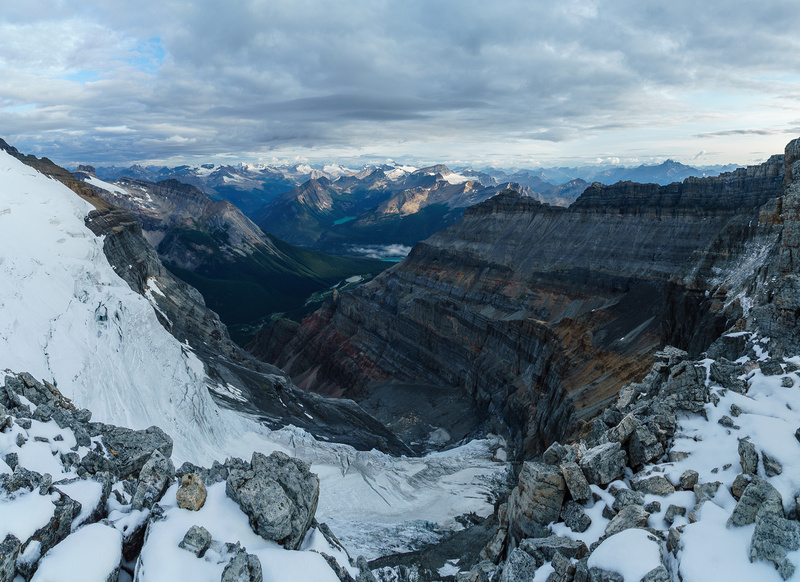 A glance back at our summit, high above the trail at upper right.